Assassin’s Creed IV: Black Flag is a deep, enjoyable game that does a fine job of combining the tenets of the series with the golden age of piracy. The world is meticulously crafted, and there’s loads to explore, which is ideal if you’re a fan of open-world games. Although the format the open world takes can feel like a slight departure from the stealth-tinged, parkour-tastic acrobatics of the earlier games. Assassin’s Creed is a series that has continued to reimagine its landscape. The latest metamorphosis is Assassin’s Creed 4: Black Flag - a game that takes us into the land of the pirates; a world full of ships and "Oh arr me hearties" tongue. On this fact alone it's fair to say that Assassin's Creed III was something of a disappointment. Sure, it was massively ambitious and covered a really interesting part of American history in its own Creed way. But it was slow to start, featured a dull protagonist and didn't do all that much new with the series. The one thing it did introduce was naval combat, which was one of the surprise successes of that game - one that Ubisoft has evolved into an often key focus of Black Flag. The game also introduces a new pirate protagonist in the form of Edward Kenway, alongside exciting prospects such as underwater exploration and treasure hunting. On paper, it's the pirate game we've always wished for, but is it the Assassin's Creed game we've always wanted or does it fall into the same traps as the previous title? Naval battles were a fun but small part of Assassin's Creed III, but the fourth game in the series puts seafaring front and centre, taking up almost half of the game. That makes it a different experience throughout, and one that some fans might find a little boring. Yes, your ship can propel at great speed after the right number of button taps, but you might feel it’s less about the deft "assassin" part of the game’s title. It's now up to you to captain your ship, make repairs and upgrades, and hire more crew - the latter being a feature that returns from the earlier Brotherhood title. The result is that Black Flag is a more open-world experience than previous Assassin's Creed games, but sometimes it feels more like Zelda than the Grand Theft Auto on the waves. As you can tell from the title, pirating is the theme that's really explored in this game. You have the option to delve into the game's many islands to find treasure maps, some of which point to loot hidden underwater, with diving being a new feature for the series. Add in harpooning, hunting and other hidden secrets to find, and Assassin's Creed 4 really captures the thrills of pirating. Or, what we'd imagine to be such thrills anyway. Assassin's Creed's timeline becomes increasingly schizophrenic with Black Flag, which is set after Assassin's Creed II, but before III. Befuddled, you might say. Of you may not care whatsoever and just treat it as a wholly new title, indeed this might be your first foray into the series. You play Edward Kenway, grandfather of Connor Kenway from the third game in the series. However, he's a little more exciting than that game's dour and super-serious protagonist - he's a Welshman with high ambitions and a sense of adventure. Unfortunately, he's not as much fun or as memorable as Ezio Auditore, but at least he's got more spark than his grandson. He’s also got a suspiciously English accent for a Welshman that doesn’t quite add up. Throw in an Irishman and there might even be a joke here. At least the pirates you come across such as Blackbeard make up for this lack of personality, while the contemporary story is also more interesting this time around. True, it runs the risk of disappearing up its own arse - you play as a character in the present day who is hired by a game-maker to play a computer game - but there are some fun hacking minigames that represent piracy in the current day, and there are loads of detailed and well-written logs to uncover that add to Assassin's Creed's back story. If, that is, you're still following the incredibly convoluted plot by this stage. Ubisoft has really tried to address the major criticisms that Assassin's Creed III received from fans and critics. That game featured an incredibly long opening sequence that felt like a procession of cutscenes. This is meant to be Assassin’s Creed, not Beyond: Two Souls. But, fear not, such cutscenes are now gone - you're left to jump straight into the action as the main character from the off. Even loading screens have now walked the plank. Pretty much all of the game’s loads are swift, apart from the transitions between present day and the past. Still, that’s an impressive technical achievement given the size of the game. It’s a big stretch of sea out there and it takes plenty of time to sail through it all and dig deep into the various missions. On the other hand, there are larger, more important issues with the game that continue to go unaddressed. Assassin's Creed's fluid, parkour-inspired movement may have impressed upon release in 2007, but holding down two buttons to traverse the world no longer feels fun or challenging, and there are times when you end up jumping when you don't mean to. Sure, it's fun to climb tall buildings and then dive off into a conveniently placed pile of something soft, but it doesn't feel as though the game is moving with the times. Sometimes it feels a little like you can run at almost anything with a button pressed and walk up walls like a head-spinning scene from the 1986 classic Labyrinth. And the combat is even worse - it's been slowed down in Black Flag, but it's still too easy, and lacks the finesse of something like Batman: Arkham City (a franchise that’s just seen its pre-Christmas title, Arkham Origins, hit the shelves). The same goes for stealth, which just isn't as fun as some other games. We’ve seen creative titles such as the forthcoming Thief try to take the concept of light and dark to the next level, while Ubisoft’s own Splinter Cell: Blacklist mixed up the action and stealth components to make for an interesting cocktail of play. Finally, we encountered the same sort of bugs that blighted Assassin's Creed III, including characters clipping through objects or enemies looking right at you and not seeing you. Hopefully these will be addressed in a future patch. Black Flag introduces a few new features to the Assassin’s Creed pot, but they're more like small, expected evolutions, rather than anything that significantly adds to the gaming experience. Let's start with the best addition: the excellent multiplayer has been bolstered with a new Game Lab feature that opens up the world of create your own game modes. That’s great as multiplayer has never really taken off in the same way as, say, Call of Duty, so it's unlikely to be used by as great a number of players - but it's a fun feature for those that do play a sneak-em-up such as this online. One other interesting addition is the ability to use an iPad or Android tablet with the Assassin’s Creed 4: Black Flag Companion App. It’s not essential and those without devices needn’t fret too much, but there are a few features that we’ve found handy for our progression in the game. To start with, you get to control your sea-based fleet using just the application, instead of having to enter the menu screens on the game. And this can be done even when your console is dormant. Of course, you need to open up the fleet options in-game first, by completing it to that point, but when you do you can earn extra cash by sending friendly vessels out to complete missions in the same way as you did assassins in former games. All of the options for this are accessible through the app, although be aware that on smaller devices - Nexus 7 and iPad mini - the text and interactive elements can be rather small to tap or read. In addition, you have complete access to the map screen, which is updated in real-time while you’re playing the game. You can therefore tap on the second screen to set your waypoint or to fast travel to a location. But the part of the app we found of most use was for opening up treasure maps on the tablet screen while still playing the game. The problem with doing that on the game only is that you have to keep accessing the menu to see where the treasure is located in comparison with where you are standing. With a tablet at your side, you can do both at the same time. The application is free, too, so you might as well give it a go. One of the big questions on everyone's lips was just how much of a boost the next-gen consoles would give to existing titles. Black Flag is available on Xbox One and PlayStation 4, and we've been digging into the PS4 version since finishing up our initial review to see how it fares. Gameplay-wise it's exactly the same game between versions - nothing is different. All that's changed is the output resolution, which at 1080p (900p for the Xbox One) - and we're upscaling to 4K at the moment via a 65-inch TV - makes a significant difference to the visuals. The opening scene of the game has shards of rain that are so sharp they look like they would hurt if they touched you. And that's because next-gen brings with it a virtual weather system. Things like rain are far more detailed and believable, while a foliage system renders the variety of plant life in much higher fidelity. More movement, less blurring, individual leaves and strands. Now we know you might not be excited about geeking out over plants - but that's essentially what the next-gen version of the game gives you. It makes the world even more appealing to navigate, but that's about as far as it goes. The one other thing we noticed was how Assassin's Creed made our PS4 the most vocal it had yet been. The disc drive made lots of whizzing noises with the frequency of a yo-yo in some scenes of the game. Not a problem with the game's volume up, but it can continue to happen when paused which is a bit annoying. Assassin’s Creed 4: Black Flag is a deep, enjoyable game that does a fine job of combining the tenets of the series with the golden age of piracy. As in the age of Blackbeard, not buying knock-off DVDs down the pub. The world is meticulously crafted, and there’s loads to explore, which is ideal if you’re a fan of open-world games. Although the format the open world takes can feel like a slight departure from the stealth-tinged, parkour-tastic acrobatics of the earlier games. Furthermore Assassin’s Creed IV still doesn’t innovate above and beyond its predecessors. It's all a bit the same in terms of gameplay, even if the world has done well to take us to an entirely different place. Its combat system has got worse rather than better, though, while issues with stealth being pushed aside continues to persist. But for all its negative quirks, there are treasure chests of positive ones too. Black Flag makes us hold up a white flag in surrender because we've enjoyed playing it; it’s a good game that fans will enjoy, just not quite the great game it could have been. Dressing up the protagonist as a pirate can't disguise the fact that this is a series in need of a more severe reboot to really bring the fun. 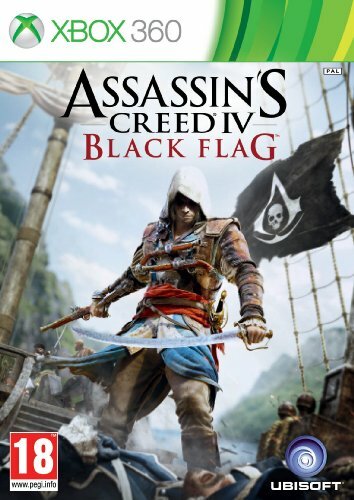 Assassin’s Creed IV: Black Flag is available for Xbox 360, PlayStation 3, PC, Wii U, Xbox One and Playstation 4.